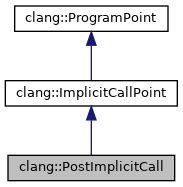 Explicit calls will appear as PostStmt program points. Definition at line 600 of file ProgramPoint.h. Definition at line 602 of file ProgramPoint.h. Definition at line 607 of file ProgramPoint.h.